“For the time has come for judgment to begin at the house of God; and if it begins with us first, what will be the end of those who do not obey the gospel of God?” (1 Pet. 4:17). Hear? Jesus condemned some for not understanding because they were not listening. “Why do you not understand My speech? Because you are not able to listen to My word” (Jn. 8:43). If people are not willing to genuinely hear, then they cannot understand. At the same time, faith is subject to hearing (Rom. 10:17). Believe? The truth is something that is worthy of and requires belief. Jesus asked in John 8:46, “Which of you convicts Me of sin? And if I tell the truth, why do you not believe Me?” John stated, “And he who has seen has testified, and his testimony is true; and he knows that he is telling the truth, so that you may believe” (Jn. 19:35). It is imperative to accept the truth when we are given it. We are not entitled to have another chance to receive it. Paul said of the Ephesians, “In Him you also trusted, after you heard the word of truth, the gospel of your salvation; in whom also, having believed, you were sealed with the Holy Spirit of promise” (Eph. 1:13). Rejecting the truth about Jesus is dangerous to the soul and will cause one to die in their sins (Jn. 8:24). Repentance? Repentance toward God is having a change of mind that leads to a change of action to please Him. Repentance is seen in our actions. For example, Paul describes such when he taught that the thief was to steal no more and work with his hands what is good while having a willingness to share with one in need (see Eph. 4:28). The one who repents will stop speaking corrupt words and replace those with words that edify (Eph. 4:29). How essential is it for sinners to repent? Paul explained to some in Athens “Truly, these times of ignorance God overlooked, but now commands all men everywhere to repent, because He has appointed a day on which He will judge the world in righteousness by the Man whom He has ordained. He has given assurance of this to all by raising Him from the dead” (Acts 17:30, 31). Men everywhere have been urged to repent from the Jews who heard the apostles to the Gentiles (Acts 2:38; Acts 20:21; Rev. 9:20, 21). Baptism? 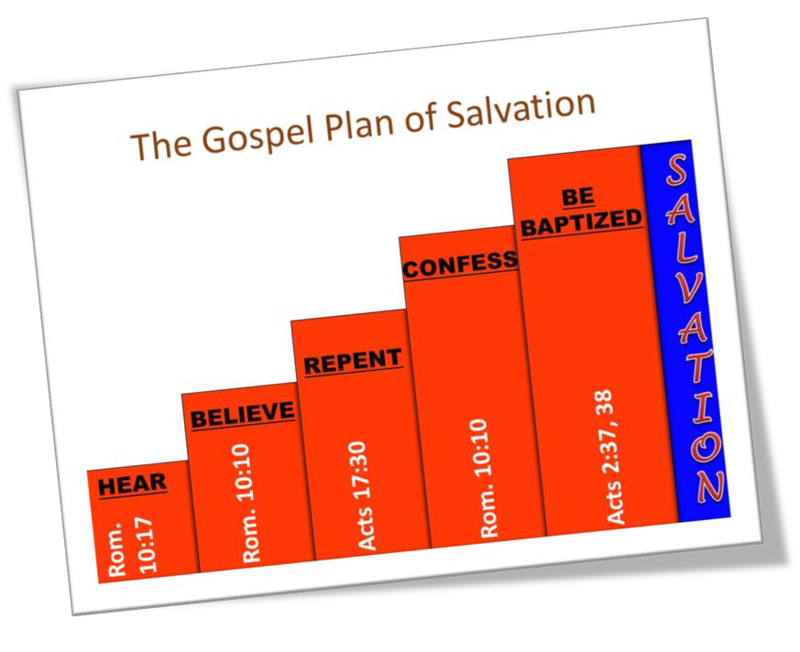 The gospel plan of salvation requires a person to be baptized (immersed) in water for salvation. This is what God requires despite the fact that many have tried to cut this step off. As the other things mentioned above are spoken as being needed for salvation, so baptism is. After talking about Noah’s salvation through water, Peter observed, “There is also an antitype which now saves us—baptism (not the removal of the filth of the flesh, but the answer of a good conscience toward God), through the resurrection of Jesus Christ” (1 Pet. 3:21). That this is not Holy Spirit baptism is self-evident. What would a spiritual baptism have to do with Noah’s flood waters or with the parenthetical explanation, not the removal of the filth of the flesh? No one would confuse Spirit baptism and the washing away dirt from the body as such a baptism never had a drop of water in it (cf. Acts 2:1-4; 10:44-48). Further, Holy Spirit baptism was never commanded or performed by any apostle. Water baptism was commanded and administered by man (Acts 8:36, 38, 39; 10:47). Such would warrant the clarification that Peter gave in 1 Peter 3:21. Paul, like Peter in 1 Peter 3:21, places baptism as the link to connect with grace. “Buried with Him in baptism, in which you also were raised with Him through faith in the working of God, who raised Him from the dead” (Col. 2:12; cf. Rom. 6:3-6). To bury something shows that something died and every burial is significant because every death is. For the Christian, the old man of sin had been crucified and buried. That is a major component of Christianity! “Knowing this, that our old man was crucified with Him, that the body of sin might be done away with, that we should no longer be slaves of sin. For he who has died has been freed from sin” (Rom. 6:6, 7, emp. added). Equally important is that a new man rises with Christ from the watery grave to walk in newness of life. Baptism is therefore shown from the Scriptures to be the meeting place of grace and faith. This is no doubt why the Lord stated that belief and baptism were both needed to be saved (Mk. 16:16). 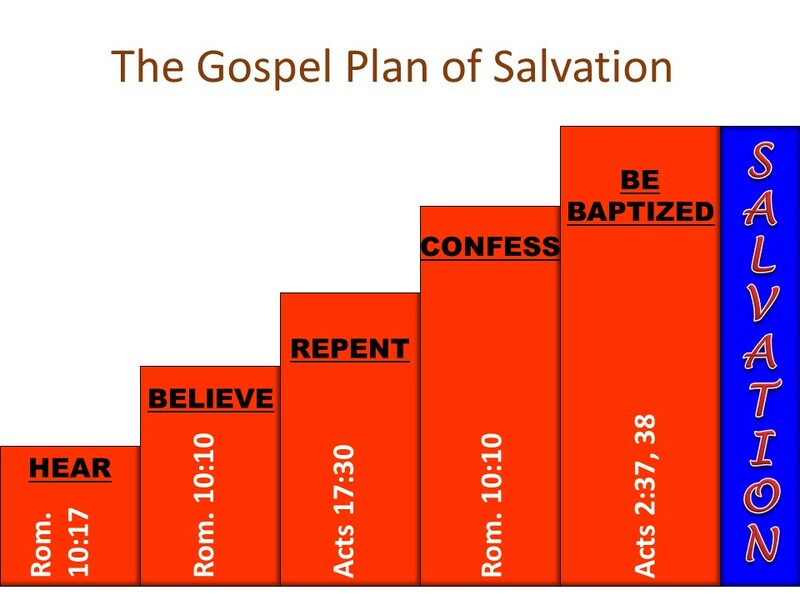 Have you obeyed the gospel? If not, you need to otherwise your future outlook is filled with a fiery vengeance from heaven. If you have obeyed the gospel, are you faithful to Christ and working as a member of His church which He purchased with His own blood (Acts 20:28)? "that if you confess with your mouth the Lord Jesus and believe in your heart that God has raised Him from the dead, you will be saved. For with the heart one believes unto righteousness, and with the mouth confession is made unto salvation. For the Scripture says, 'Whoever believes on Him will not be put to shame.' For there is no distinction between Jew and Greek, for the same Lord over all is rich to all who call upon Him. 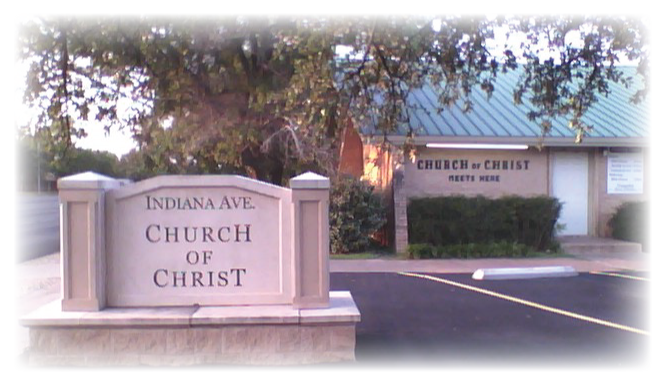 For 'whoever calls on the name of the LORD shall be saved.' How then shall they call on Him in whom they have not believed? And how shall they believe in Him of whom they have not heard? And how shall they hear without a preacher?" (Rom. 10:9-14).